Being pregnant with and giving birth to triplets carries a higher risk of complications than a singleton pregnancy. Knowing what to expect and how to prepare for your childbirth will reduce any anxiety. Make sure you organize and get everything ready at home weeks before your due date on the chance you might deliver early. Anticipate multiple clothing, diaper, and feeding needs for your newborns, as well your own needs and that of of your other children and household. Also plan for the additional financial hospital costs and the financial resources you will need to support three newborns, especially if any have disabilities. To prepare for the intricacies of your childbirth, have a detailed discussion with your medical team beforehand. Discuss your birth preferences with your doctor to see if any can be safely integrated into his recommendations. Talk about what will happen if a change in plan is necessary when you are at the hospital. A triplet pregnancy and birth are considered high risk. You might have a desired birth plan and wish for a birth without medicines or interventions. However, be prepared to adjust your expectations for a natural birth or vaginal delivery. You might still be able to integrate some elements of natural childbirth, but your doctor will follow certain established guidelines to limit the risks for you and your triplets. Decision-making on the best mode of delivery for triplets can be complex. Your doctor might prefer you to have a cesarean section for delivery of your babies. However, if conditions are favorable, he might allow you to proceed with plans for a vaginal birth. Your weeks of pregnancy: For safety, doctors prefer a cesarean birth if you must deliver before 32 weeks. The babies' condition: A cesarean birth might be preferred if one or more of the triplets has a birth defects, there are significant differences in growth between the babies, or the babies are small. Size of the first (presenting) baby: You can have a vaginal delivery if the baby closest to the cervix (Twin A) is the largest. None of your babies should be far smaller than the others. The mother's state of health: If you have a medical problem, such as heart or lung disease or severe high blood pressure, a planned cesarean delivery might be safer than a prolonged labor and delivery. Position of the presenting baby: If the first baby in line to come through the birth canal is lying head first and the other babies are also aligned, then you will be allowed to progress through labor. If not, a cesarean section will be less risky. Triplet babies are at risk greater risk for lying in difficult positions in the uterus, which can make vaginal birth more dangerous. Also note you might have a vaginal birth for the first baby and end up with a C-section for the other two. If your doctor recommends plans for a vaginal birth, talk to him about the signs and symptoms of labor and what to do if your water breaks. Don't delay going to the hospital when you go into labor or your water breaks. Each baby will be monitored separately to keep track of each fetal heart rate. Because of the additional fetal monitoring and other equipment in the room for a triplet birth, you might not be able to walk around during your labor. A team of physician specialists will manage your childbirth. In addition to your OB doctors, there will be other medical personnel to attend the birth, including extra nurses and pediatricians. You might be allowed to have a doula if you want the extra support. You have a greater likelihood of getting an epidural to ensure you have adequate pain control, in preparation for a difficult vaginal delivery, or in case you need a C-section. 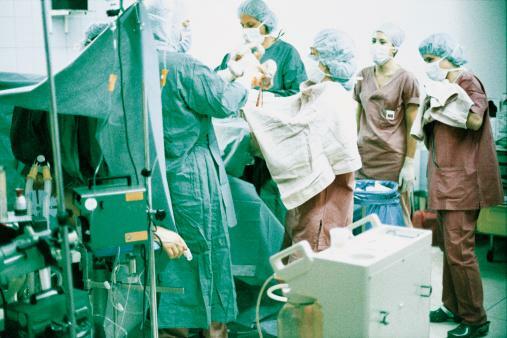 Depending on your doctor's and hospital's policy, once you reach the second (pushing) stage of labor you will likely be moved from your labor room to an operating room. This is done for safety and in case you need an emergency C-section to deliver any of your babies. Be prepared that you might have a longer labor and delivery process than if you were pregnant with one baby. You have a planned C-section before you go into labor on your doctor's recommendation. You might have an unplanned C-section because of complications during labor for a vaginal birth such as failure to progress or fetal distress of any of the babies. You have an emergency C-section after vaginal delivery of the first baby because of distress of the second or third baby. You need a C-section to deliver the second and third baby because their position in the uterus is not safe for a vaginal birth after delivery of the first baby. Immediately after birth, the assigned personnel will examine, care for, and stabilize each baby as needed. They will assess Apgar scores at one and five minutes while attending to the medical needs of each baby as they are delivered. In the order of their delivery, each baby will be foot-printed and tagged with a wristband marked Baby A, B, and C for identification. This will also help you keep track of the identity of your babies. You will get to see and may hold your babies if they are stable enough. Otherwise, one or all three will be taken to the neonatal intensive care unit (NICU) as needed. You will be able to visit any of your babies that are in the NICU as soon you are stable. You will go home sooner if you had a vaginal delivery but chances are, one or all of your babies will stay in the hospital longer. If so, you will be able to visit, interact with, and help care for them in the NICU until they go home. 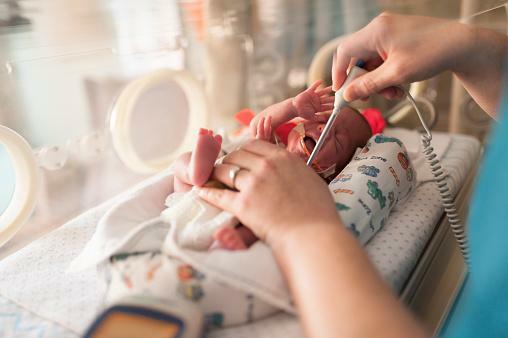 One or more of the babies of a multiple birth might have to stay in the hospital for several weeks if they are born preterm or have any complications. 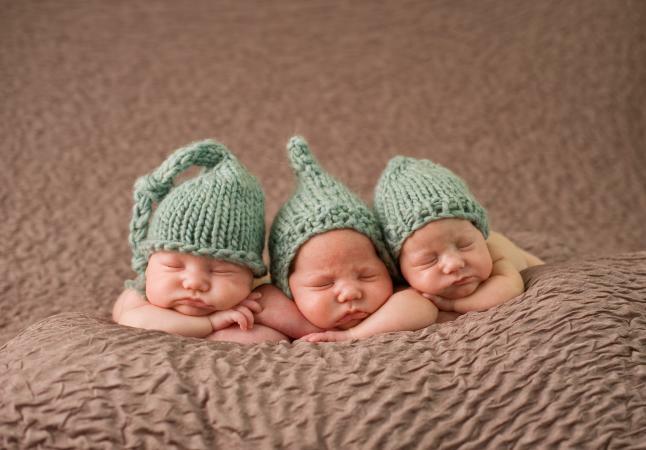 The most common complication of triplets, twins, and other multiple pregnancies is preterm birth (before 37 weeks), according to an American College of Obstetricians and Gynecologists fact book (page 364). Ninety percent of triplets are born before 37 weeks - most at 32 weeks or earlier. Risk of postpartum hemorrhage because the uterus has difficulty contracting to slow bleeding. Treatment might include uterine massage, medications, or in some cases a hysterectomy. Birth before 37 weeks presents the biggest risk for triplet and other multiple pregnancies according to the ACOG reference cited above. Respiratory distress syndrome (RDA): This is the most common problem in preterm infants. It results from premature lungs not being fully developed, which makes breathing difficult. Patent ductus arteriosus (PDA): The ductus arteriosis, an open channel between the two major vessels of the heart should close right after birth. If it remains open, the baby will have difficulty with blood flow to his body. He might need medicines or surgery to repair a PDA. Intraventricular brain hemorrhage (IVH): This is bleeding into the fluid spaces, or ventricles, of the brain. It can happen spontaneously in premature babies and lead to brain damage. Necrotizing enterocolitis (NEC): Very premature babies are at risk for inflammation and death of tissue in the gut, which can lead to difficulty with nutrition and death of the newborn. Retinopathy of prematurity (ROP): Abnormal growth of blood vessels in the retina of the eyes - essential for vision - can cause blindness if severe. Mild cases of ROP usually cause little or no trouble with vision. Cerebral palsy (CP): A movement disorder caused by damage to areas of the brain that control motor function can be associated with long-term mental and other impairments. Other long-term impairments caused by prematurity and its complications include hearing loss and poor physical, mental, language, learning, and social development. The more premature the babies are at birth, the greater the risks for newborn and long-term problems. According to an American Society of Reproductive Medicine (ASRM) patient booklet (page7), in about 20 percent of a triplet pregnancy at least one child will have a major long-term problem. Triplets born at term tend to do as well as singleton or twin babies. It will be challenging to care for three newborns when you bring them home, especially if you are still recovering from pregnancy and childbirth. You will be sleep-deprived and can feel over-stressed with the multiple round-the-clock feedings, diaper changes and baths. Ask for extra maternity leave if you feel you need it. If you breastfeed, which is recommended, coordinating a workable schedule can also be stressful. Get all the help you can from your partner, family, and friends because you will need it to help you cope, manage, and enjoy your miracle babies. Don't hesitate to reach out to your doctor and others on your medical team for emotional and psychological support if at any time you feel overwhelmed. Be sure to ask for help if you have symptoms of postpartum depression, which is more common in parents of multiples. Also tap into other sources of information and recommendations such as the ASRM factsheet, Challenges of Parenting Multiples and the KidsHealth, Parenting Multiples webpage.